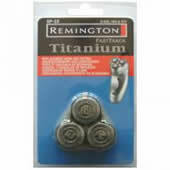 Pack of 3 replacement rotary cutting heads Replacement Foil for models R950, R960, R970, R851. The deterioration of the shaver cutters is slow, so that it is only when fitting new ones that I discovered how blunt the old ones had in fact become. It is great to get a quick close shave once again! I bought this product on sunday and was with me by Tuesday lunch time. It is excellent product and will enjoy good shave for further almost 2 years now. is it the wright part ? great service, well packaged.no complaints .only I ordered wrong part, ie for wrong shaver.SO my tip always double check you have correct part..